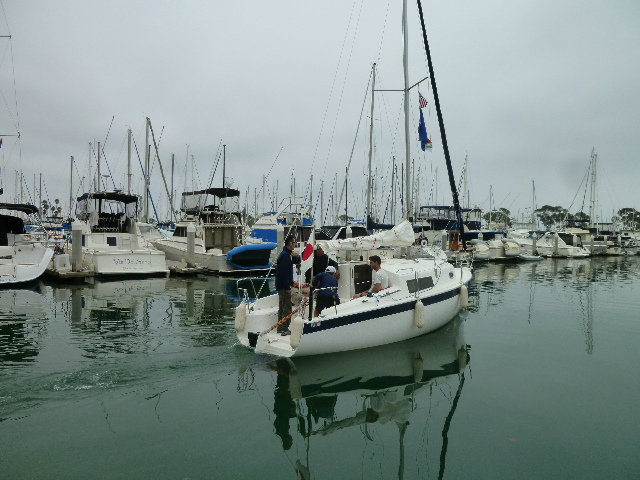 This year at the Islander 36 yacht club year-end event, the Eco friendly sail boat, Zen 24 made by Aoki Yachts of Osaka attended the year end sailing ceremonies at the Oakland Yacht Club in Alameda, Ca. 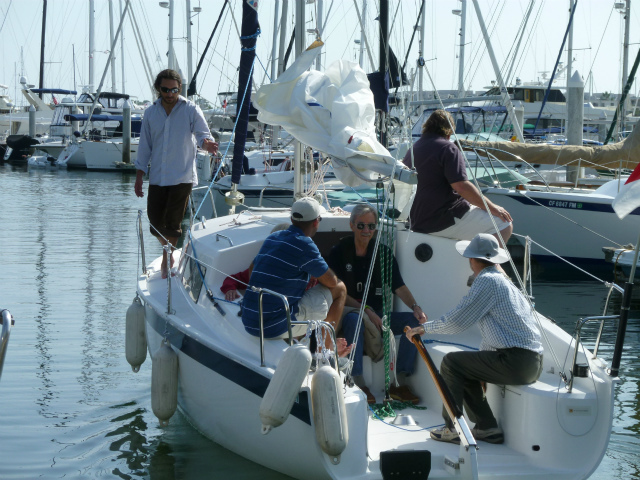 The crew of Zen 24, flying the Eco Flag presented the boat to demo the virtues of non-pollution sailing with the use of an electric motor for those times when power is needed. 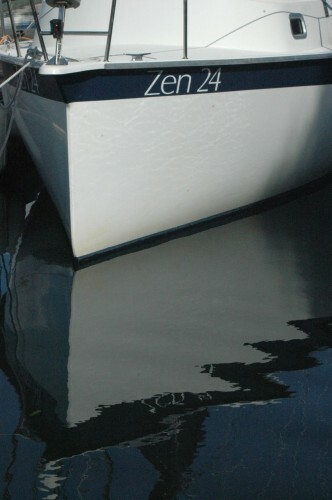 The Zen 24 when sailed at 5kts will regenerate a battery from it’s own prop’s rotation. With the use of an optional solar panel this pocket cruiser from Japan can be made to be self sustaining in it’s power needs without the use of fossil fuels, which pollute the air and water. 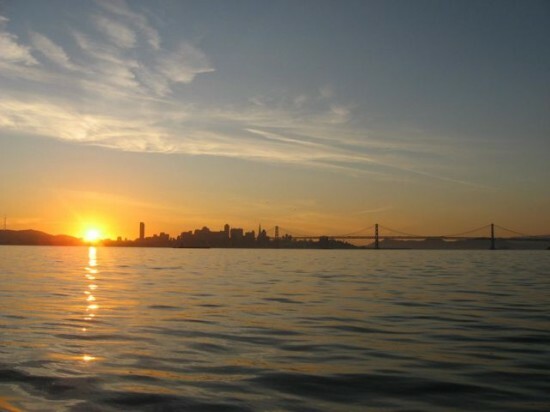 The boat of the future is here now within Eco-friendly principals of recycle, reuse, rethink. I am writing this post on my iPod Touch while underway on the Zen24. 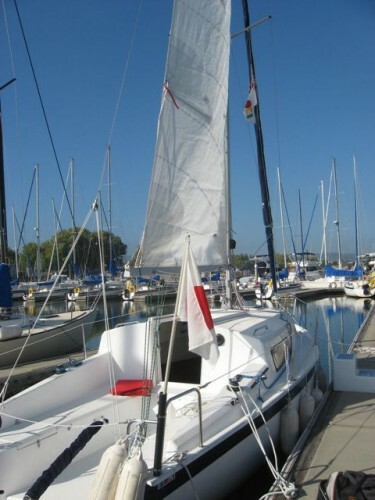 I thought it may be interesting for readers to share an under sail experience. 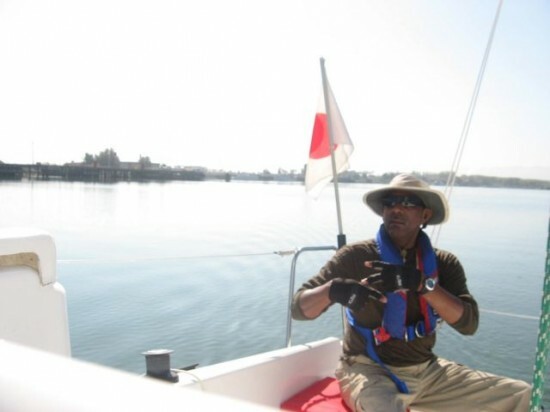 I am a US Coast Guard Licensed Captain and an ASA instructor here in the San Fransico Bay Area. This is my first experience single handing the Zen24. 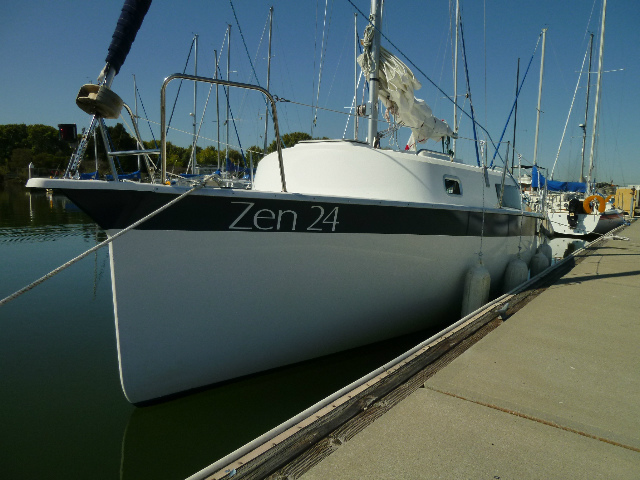 I did double hand sail the Zen24 down to Redwood city. The conditions were mostly light then and we had to motor 85% of the way. The distance from Redwood city to Alameda is about 27 natical miles. It has been very light winds so far and I have been under power for about 1.5 hrs before picking up some wind. My average speed under power was about 3 knots my battery use was about 1 percent. I started with the rating at 100 %. Now it is down to 99% about 1 hour later. 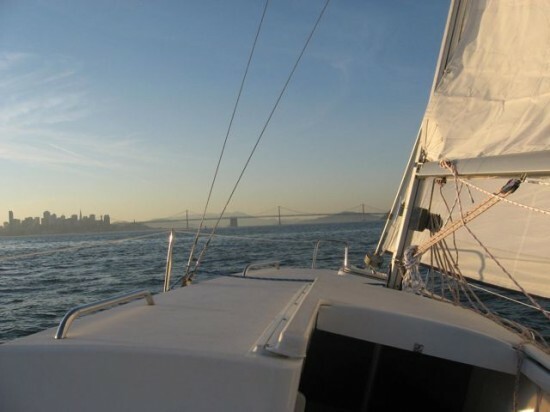 I have now picked up a little wind and increased speed to 4.5 knots riding the ebb tide out to the Golden Gate Bridge. I am not going there but beyond that is the ocean so you have an idea of the flow of things. From here at this time my ETA is 3.5 hrs. The breeze continues to pickup … Yokatta! Once I have some steady wind and sea room I will cut the motor. Right now the channel is small so I have to keep a tight course or end up grounded in the mud. I started sailing at 11:30 , it is now 1:30 and I have just eaten lunch. I near the San Mateo Bridge, the gateway to the East Bay. The cars in the distance crossing the bridge are louder than the motor under way. 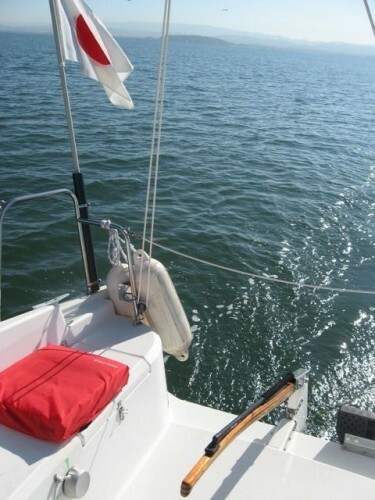 At 1:35 pm, I cut power and now am at one with the wind doing 4.4 knots…sugoi…Banzai!! 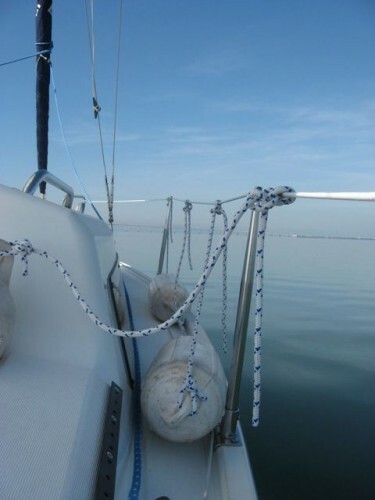 My first tack and I am dead on course headed for the bay bridge now. It seems like most of the drive is coming from the jib as the main is almost slack. It could use some fine tuning. I continue to be amazed at how well the boat heads to wind. I am about 10 degrees off wind on the nose. The wind as dropped a bit I am doing about 3.5 going by the gps reading. The boat has an amazing light helm and holds course with little effort! 2:14 pm doing 2.7 kts wind has dropped a lot, There is a bit of sadness, even in joy. Still moving under just wind I will hold until down to 2 kts before using motor again. Part of the forward movement is do to the tide I know. Like in life sometimes that is all you have to go forward with, the motion of life, ride with it. I have about another hour of ebb left. The low tide end point, the ebb ends at around 3:00 pm. Back under power at 2:25 running at 2.5 knots still reading 99% juice left. 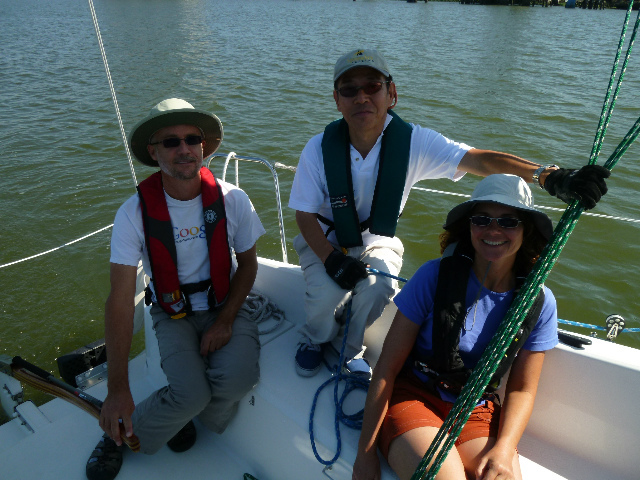 I am near now to where Itaru san and I stopped to recharge ourselves with a nap and the boat with a little power on the trip down. At that time we had zero wind and were riding against the tide on glass surfaced water. The wind has picked up slightly and I am doing 4 kts again with wind and power. Feeling much better than the trip down to to Redwood city, knowing now how things work, the distance, the power usage. It would be nice to have a rpm gauge. 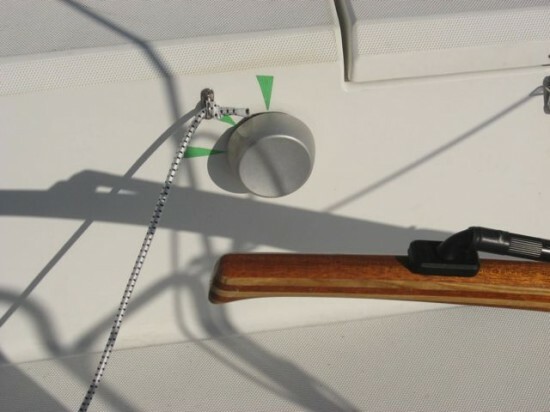 Yet as the wind helps push the boat, the sound of the motor changes do to the reduction of the load. So I guess the RPM would not be a true indication of the motor speed. Ebb tide is over. I have about 1 hr before the flood starts. Doing 4 kts with wind and power. Motor off at 3:00 pm. 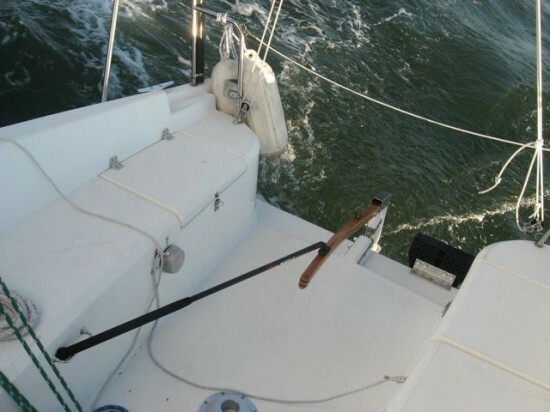 Boat self steering while I write this up date holding 3.5 knots on a steady course. 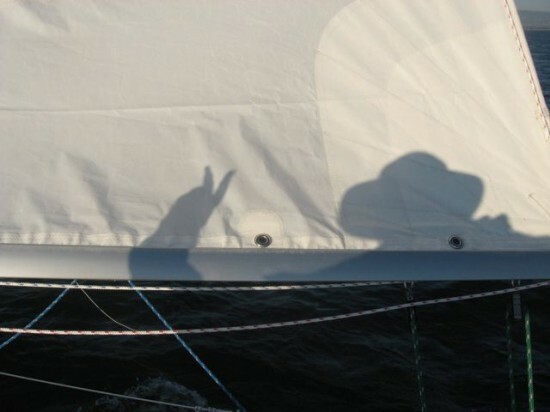 If this wind would hold I feel like I could do some Zazen, while the boat sails it’s self. At 3:22 pm only a small touch of the helm to adjust course while I took a snack break… Sweet! Holding 3 knots, no motor. 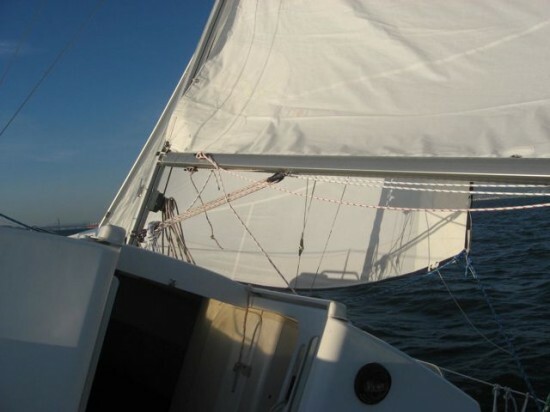 However as I type, the speed and wind drop but still on course with no adjustment to helm. Down to 2.2 kts still on course. Adjusting course closer to wind added motor. Power at 98% left. Yokatta, the wind is back!! Motor off, speed at 3.0 kts plus. 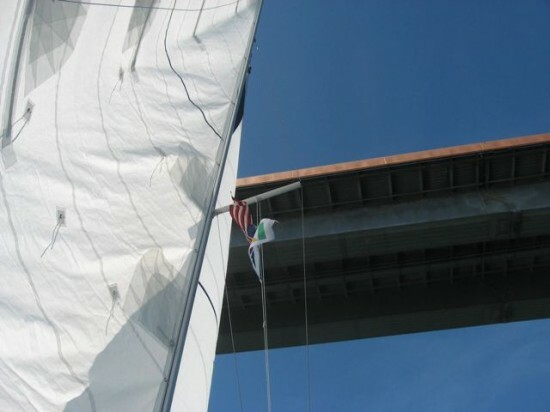 Heading dead at midway point of the Bay Bridge…3.3 kts and steady. Motor back on at 4:00 pm running 2.5-3.5 knots. Wind is up and down. I would like to be home not too long after or near dark. Power at 98%, 4 hours still to go before ETA. Tide is turning against me now and waves are building. The Z/24 is running at about 1/2 power open throttle. At this speed there is more motor noise, but not excessive, not a lot, just more now in one’s moment existence awareness… I am more mindful of it. Still far from the harmony distrubing sound of a gas motor. S.F. 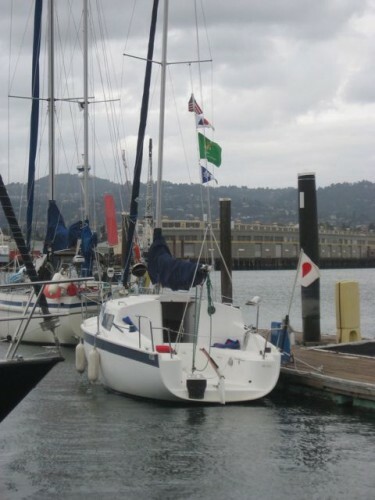 Bay Ocean winds just kicked in… Yay 4.5 plus knts under sail only…Yatta! I had to heav-to and get my jacket, shishi and reduce jib!!!! Things were a bit hectic/intense for a while. Sailing at 4.7 knts lots of chop now. Boat handles it well, even as light as it is! 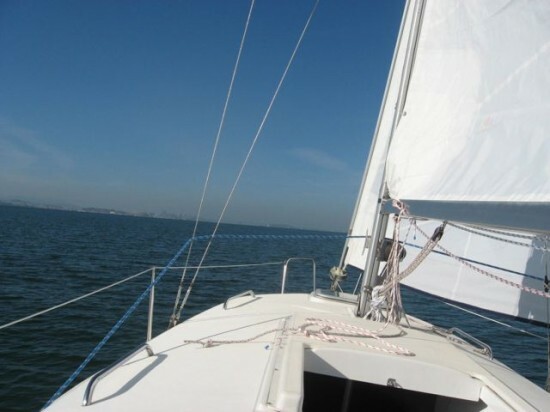 Once the sails were trimmed for the conditions it is again a pleasant ride. 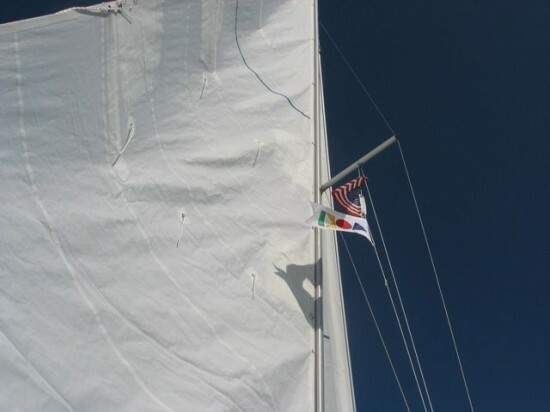 I did not reef the main, but reefed the jib and let out the main a some to bleed off some wind. Now back to light winds almost boring after that rush!!! I may need to motor again!! Sugoi changes!!! 6:20 pm last leg of the trip. Wind is dying, under motor running at 4.5kts, motor/battery power at 96% left. 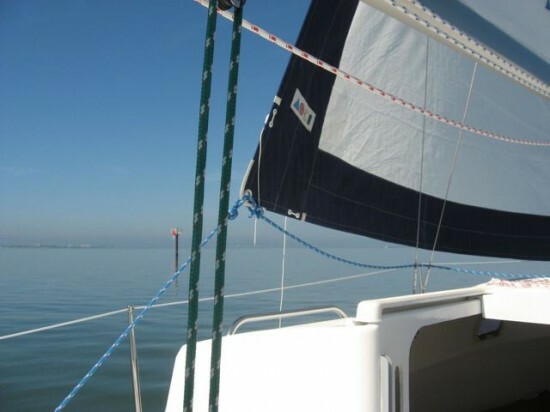 Main Sail lowed and tied, I’m heading down the estuary at sunset. 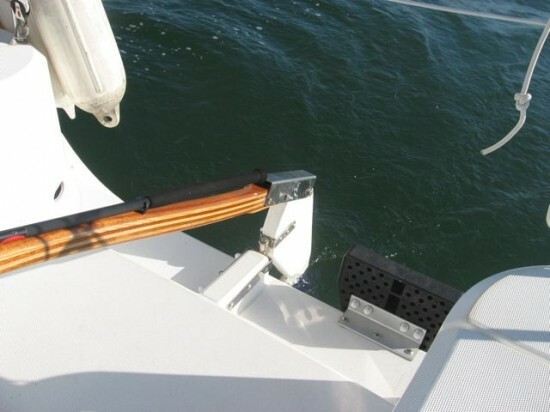 Biggest hassle is jib knots catching shrouds. This is something that needs to be taken care of. It is a small thing and under a better wind it would not be a problem…but for now , it is a hassle. 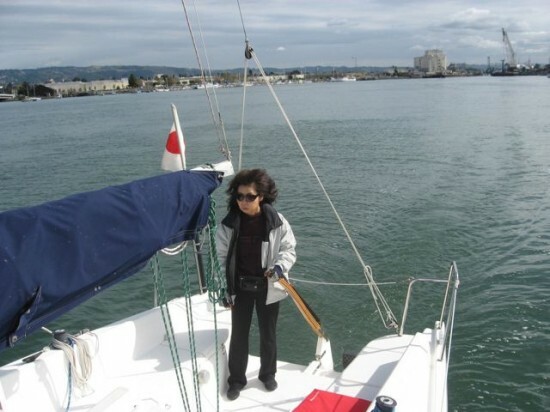 I made it back to home port on the Island of Alameda. It is after dark, but I can see enough to make it by sight and feel into the slip. I motored the last 30-45 min. down the Estuary at about 4-5 kts. It was gettign dark, the ocean going containor ship were also coming down the Estary heading into the Port of Oakland and very busy place. I needed to keep out of their way. It was a good trip, long but good. The GPS, says I traveled slightly over 7 hours. At seven hours of solo sailing I am tired but pleased with the trip and the boat. 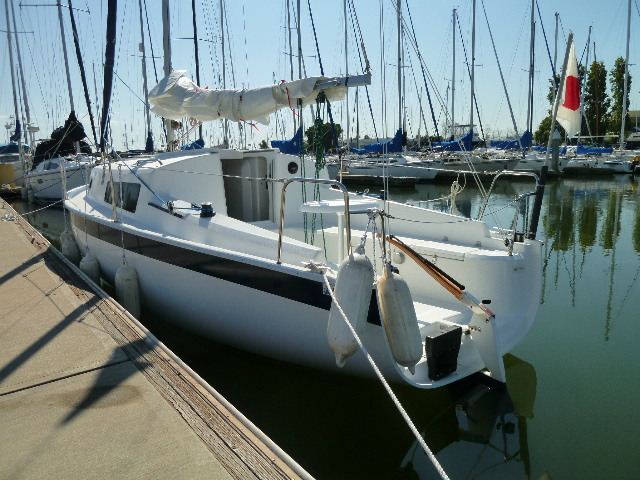 The final reading on the Batteries was at 92% when I glided into the slip at Alameda Marina. 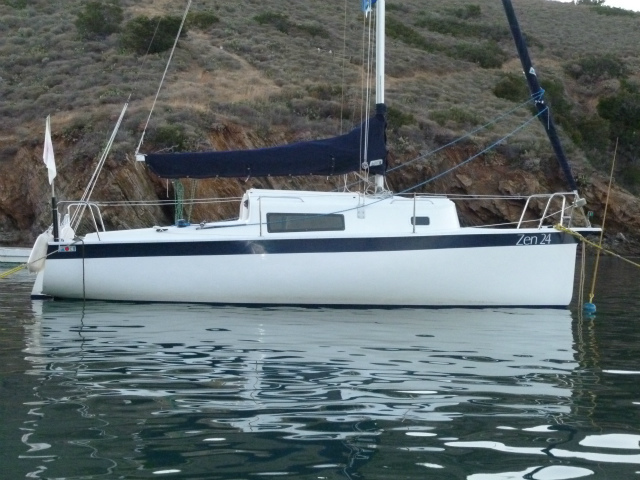 If I was in the market for a small boat this would be a great buy, feeling larger than it is and able to handle diverse conditions.